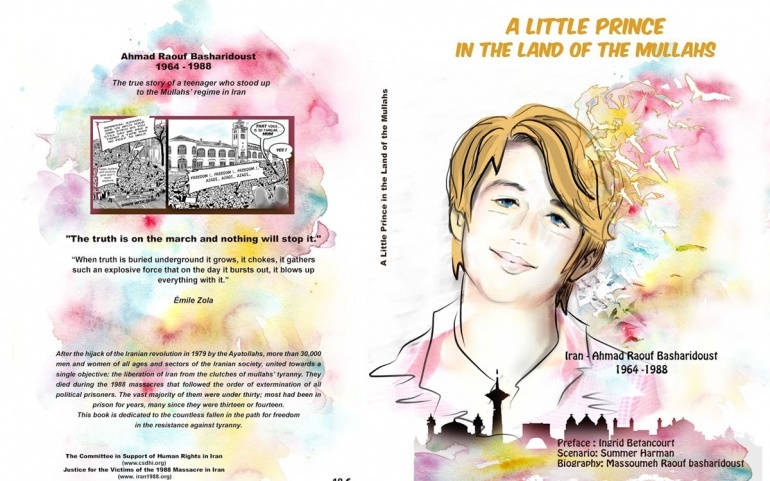 The story of “A Little Prince in the Land of the Mullahs” is a graphic novel about the Iranian youth’s fight for freedom. Published by “Société des écrivains” publishers and prefaced by Ingrid Betancourt, this new graphic book is the story of Ahmad, an intrepid young Iranian, driven by the ideals of freedom, shared happiness and equality. Carried by the hope of one day making them known to his country and people, he faced the violence of the totalitarian regime of the mullahs, risking his life in a long and difficult struggle that took him to prison. Ahmad Raouf-Basharidoust, born in 1964 to a middle-class family and raised in northern Iran, tells of his childhood in Shah’s Iran, the 1979 revolution and Khomeini’s rise to power. He goes on to depict the circumstances in which this intelligent and curious teenager became an active sympathizer of the People’s Mojahedin of Iran, the democratic opposition to the mullahs. After more than five years in prison, he was murdered in the summer of 1988 on the orders of Khomeini who had issued a decree commanding the massacre of political prisoners in Iran. Through reading this story, not only do we discover Ahmad’s own particular journey, but also the history of a whole generation who lived this revolution and was crushed by the cruelty of the mullahs; a generation that said “no” to Khomeini’s Islamism and his hangmen, despite the terrible conditions of prison and internment; a generation with a dream of freedom and democracy for Iran. This story also takes us through the contemporary history of a very ancient nation, covering the period 1964-1988. The true story of a teenager who stood up to the Mullahs’ regime in Iran. Ahmad’s story, told in comic book form, is certainly not a children’s story. Yet, that is how her sister Massoumeh wanted to share it with us. Perhaps that is because this story, which she has carried in her heart for 30 years, is made up of images that are too strong – those of her own life – images that are painfully engraved and that she did not want to betray. Massoumeh did not want to write just another story to talk about her brother. She did not want to present cold statistics and a politically correct analysis. Massoumeh wants us to grasp with our emotions that which is inaccessible through reason. She needs to bring her brother back to life, so we can get to know him, so he can enter our space, our time, and also – who knows – maybe finally our hearts. Telling the story of your little brother is a need, of course, but it is above all a right. It must honor Ahmad’s heroism, the majesty of his spirit, his beauty, his charisma. That is why she draws him for us and makes him speak, because she knows that he alone can be his best spokesperson. At the turn of each page we discover him in action, surrounded by his family, in his house, in his street, in his school, with the beautiful landscapes of his native country as a backdrop. We meet his friends and with them, his dreams and fears. Ahmad is there, in front of us, playful, intelligent, courageous, and poetic. We see him growing up in the tumultuous Iran of the 1980s. He became an adult, almost in spite of himself, probably too early, shaken by the violence of Khomeini’s dictatorial regime in Iran. From Ahmad’s hand we are entering the heart of the Iranian Resistance – that of the People’s Mojahedin. Early on in his twenties, he and his companions dream of a better future, without oppression, without fanaticism, without exclusion. And in this suffocating and misogynistic world of the mullahs, his heroes are his mother and sister: a sister who manages to escape from prison, a mother who dies under the persecution of the regime’s executioners. The story of the little prince in the land of the mullahs reveals to us, without any pretenses, the human tragedy facing millions of Iranians. With Ahmad, we can go through this tragedy, live it and try to understand why, so that the truth can no longer be hidden, so that justice can be done, and so that the liberation so long awaited by the Iranian people can happen.